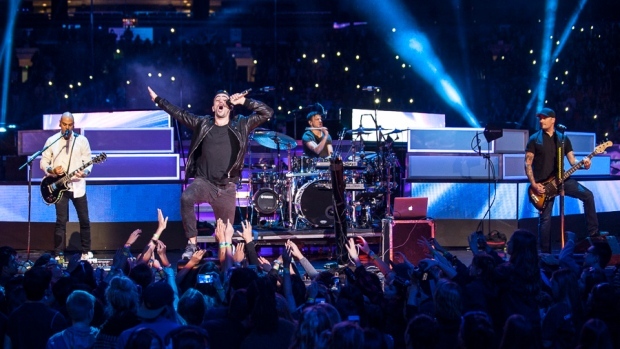 Hedley is seen performing at We Day 2015 at the Rogers Arena in Vancouver. (Anil Sharma, Julia Lof, and Kaja Bakken). KELOWNA, B.C. - Fans of embattled Vancouver pop-rockers Hedley were handing out flyers in support of the band ahead of what could be their last concert in Kelowna, B.C. The group announced they'd be going on an "indefinite hiatus" earlier this month under a cloud of sexual misconduct allegations against frontman Jacob Hoggard. The the group has been dropped by its management team, blacklisted by scores of radio stations and abandoned by musicians booked as tour openers. Laura Carruthers photocopied 3,000 flyers asking people to sign a petition urging radio stations to reinstate airplay for the band. She was in the parking lot outside Kelowna's Prospera Place ahead of the concert handing out the pages, which have the phrase .istandforhedley written on them with hearts drawn in red glitter.